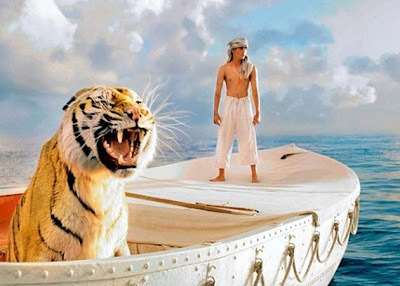 "Life Of Pi" must be the most beautiful film of the year, a technical marvel, and magic realism at its most magical. This is a story about life, in every one of its forms, real and imaginary, and life can hardly ever exist, without the presence of other life. In Pi’s journey, the ocean sparkles. After losing his family in a tragic shipwreck, during the deadly storm, Pi spent 227 days in the lifeboat, in an uneasy company of the Bengal tiger, Richard Parker (another interesting story of how the tiger ended up with his regal name). This is a story of transformation where a child becomes a man, first dealing with fear, then thirst, then hunger, threats from a hyena, then a fierce will to survive, loosing his rations in yet another deadly storm, unpredictability of the ocean, his face-off with the tiger and then his acceptance of the companion on board. In the end, he sums it up, “my fear of him kept me alert and tending to his needs gave me purpose”. The most stunning period in the journey was when Pi found himself on the algae covered island, fully inhabited by millions and millions of meerkats. Island’s fresh ponds were full of fish that swam at night but were dead in the day, and meerkats climbed up the trees to spend the nights in the trees. Pi finds a tooth of a human, inside a fruit and comes to the conclusion that the island is carnivorous. He stocks the lifeboat with dead fish and meerkats for Richard Parker and with sea weed for himself and calls Richard Parker and pushes off again into the sea. Parker’s eyes are so powerful they actually manage to flood your brain with the questions layering the theme of the book – whether it is possible to tame a wild animal and become friends with it, and whether a wild animal whose life you save will ever return your favor. I fell in love with the character of Pi, in the first few minutes of the movie, when he questions his father who was chastising him for his belief in all religions. While the visual effects are stunning, I was equally impressed with the cast, the performance of the players, the dialog, and the amazing journey. Life of Pi is two different movies put in one – the first is a gorgeous, stunning collection of frames that tosses you on an emotional journey just like its protagonist, and the second, a heavy handed sermon on the necessity of God and the meaning of life. 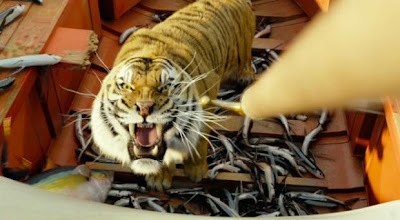 Life of Pi is full of questions that the movie does not seek to answer. 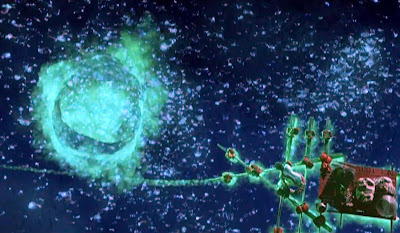 Ravishingly gorgeous visuals are embedded in an electrifying saga that tests human endurance and is anchored in bonding with other forms of life.